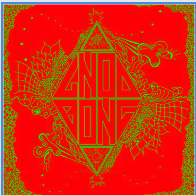 GNOD is a very cool band from the UK that I have be really enjoying their strange drone rock music. BONG, I had never heard of but they are in the same league and very stoned, as a band called BONG should be! The GNOD track is simply called Prelude and is a haunting piano based slow building track that drones and pulls at you until it fades away… Strange. BONG’s track is called Reprise and features a quite heavy doomy guitar that drones over and over while another noodles and the bass and drums pound. It becomes quite spacey as well and this aspect I really like. There is a spoken word like stoned monks in a large cathedral sound as well. Very stoney stuff. Sounds cool on 33rpm as well. As a bonus you get a burned CD-r with one 34 minute long BONG track (pretty heavy and cool stuff) and 3 tracks by GNOD, one long one that is 13 minutes long and two shorter, strange tracks. Some of this reminds me of stuff I have heard on some of their other CD-rs that I have. Good value for £6. Support this new label if you like psychedelic drone rock.